Indie Grits Film Festival « Stitch Design Co.
We’ve always been fans and admirers of the Indie Grits Film Festival in Columbia, South Carolina. Earlier this year, when the festival approached Stitch about working on the 2011 materials, we were thrilled! Andy and the folks at the Indie Grits asked us craft a new look for this year. Through the illustration and typography, we set out to tell the story of a film and all that goes into making them small works of art. The above imagery is the call for entries poster that was distributed through out the South East last week. We’re already busy working on posters, tee-shirts, lanyards and more for the festival coming this April. The mission of Indie Grits is to break down any walls that may intimidate first time media makers by creating exhibition opportunities for work that might not make it into other festivals. Indie GRITS will present a fun, exciting and enlightening opportunity for experienced and first-time media makers to come together and share their interest in independent media production. 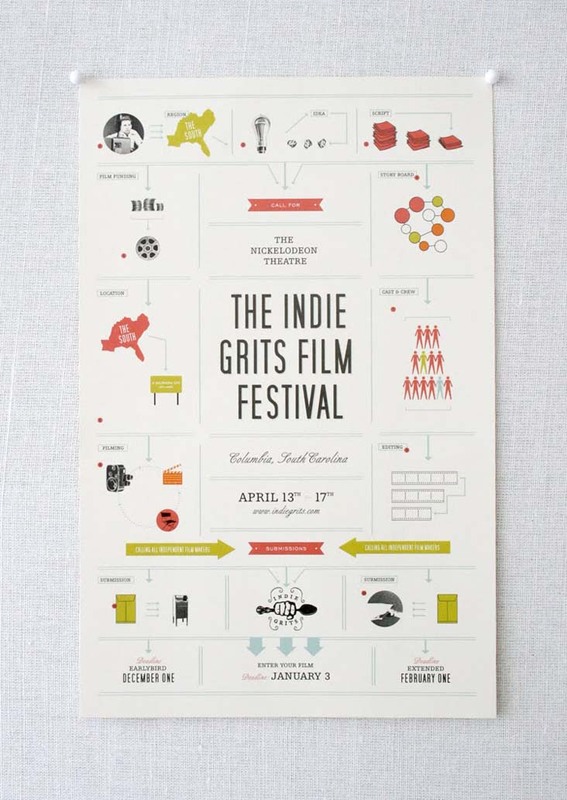 The Indie Grits Film Festival is presented and created by the Nickelodeon Theatre – the only non-profit art house film theater in South Carolina. Thanks to our generous sponsors and the tireless work of our staff and volunteers, the film fest is able to achieve its mission of creating exhibition opportunities for first-time media makers. Just came across your site and this lovely design you posted! I'm in love with the minimalism and use of white space. Thanks for sharing!